Follow me on Instagram! I post lots of smaller, very affordable pieces there! Entre Rios has published a book featuring a collaboration of my Patron Saint series and the poetry of Knox Gardner. You can order directly from me or from entreriosbooks.com. Interested in learning to make art with tin? Message me to be added to my class notification list! After working in painting and mixed media for many years, a long held obsession with decorative tins took over my studio and I began to work exclusively in tin. I am drawn to the intricate patterns, the range of colors, as well as the effects of aging; the rust, dents, scratches and fading. The tins are flattened and snipped and assembled into pieces that combine appropriated commercial imagery from the past into something new. I often incorporate Civil War-era tintype photos. 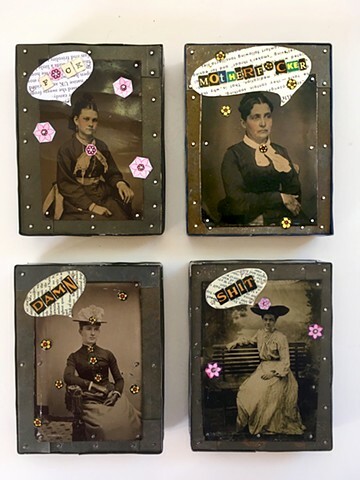 The contrast and balance of the colorful tins with the gray tones of the tintypes and the somber expressions of the tintype faces is an essential part of my compositions, often evoking a sense of nostalgia and melancholy that is central to my work. Choosing the perfect photo for each piece is a sort of casting call. I comb through hundreds of photos to find the perfect image. My recent series, Patron Saints, was particularly challenging as each photo had evoke a sort of saintly countenance as well as, ideally, a clue to each patronage. I am fascinated with the seemingly endless possibilities and stories that I can coax from these small pieces of metal.